The alarm goes off. It is 4am. Rain is falling outside and I’m nice and dry inside my sleeping bag – inside my old 4-Runner 30 miles from Presidio, Texas, in Big Bend Ranch State Park. I had made the 8.5 hour trek to this location for two main reasons – to photograph the landscape from the highest point in the park – Oso Peak – and to make a return trip to Fresno Canyon to photograph sunrise. But is is 4am and raining. I’m not sure I want to crawl from my warm bag and drive 20 minutes down a dirt road to the trailhead. But I do, and soon I’m bumping through the dark while trying to munch down a protein bar and sip from my small bottle of Sweat Leaf peach tea. How many people would really do this? How many people have even heard of Fresno Canyon and the Solitario? Rain is still falling as I reach the trailhead. I put on a headlamp, calibrate the GPS, double check the tripod, camera, and lenses, gatorade, and snacks I’m bringing along, and with a flashlight in hand and headlamp on, head into the dark. I’m torn… the clouds above show patches of light and dark, but the rain is still gently falling. This trek is all about faith.That’s a pretty good analogy. I’ll have to remember that. I press on. The trail is relatively faint, but sporadically marked by cairns. It is an easy hike – some might even call it a walk. Every once in a while I have to turn on my hand-held flashlight and search for the next pile of rocks. This is my second attempt to reach the rim of Fresno Canyon. Last year, I lost the trail in the dark and missed sunrise at the canyom rim by about a quarter mile. I won’t make that mistake again. The rains have mostly stopped. The air is cool and I’m still in complete darkness. Stars are visible to the west and even overhead. After two miles of easy walking, I reach the edge of a large wash. A switchbacking trail leads down into the small valley, into some dense vegetation. Hopefully, no bears or mountain lions are hanging around. In ten seconds, I’m heading back up the trail to the top of the wash. Five more minutes of walking and I can see the faint outline of the Solitario, a circular rock formation that covers over 50 miles. The complex geologic structure rises from the Chihuahuan Desert and is flanked on its west side by Fresno Canyon. I know I have arrived. With dark skies overhead, I see traces of light along the ridges of the Solitario. Slowly, I step the edge of the canyon rim and peer into the abyss. Still surrounded in darkness, I’m left to wonder what it will look like when daylight arrives. Splashes of red and orange begin to outline the clouds above the distant rock cliffs. This has a lot of potential. The next 30 minutes are a blur. The sky catches fire in one of the most stunning sunrises I’ve ever experienced. The canyon seems to echo in full vibrant color. The grace and the beauty of this desolate and rugged land arise like a vast fire for a few fleeting minutes. 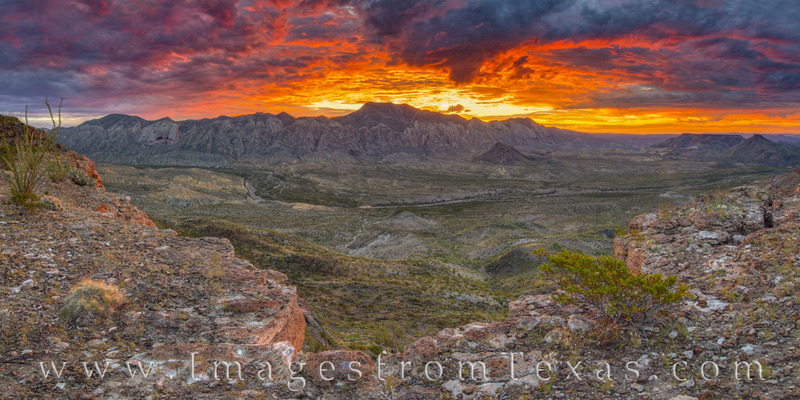 This panorama shows Fresno Canyon and the Solitario in Big Bend Ranch State Park. My morning to reach this amazing sight began at 4am. I was sleeping in the back of my 4Runner because of the overnight rains. When I awoke, the rains were still falling. Nevertheless, I organized my pack, drove the few miles down a relatively easy 4WD road, and started the hike around 5am. The rains were lighter, and I could even see a few stars in the west. Two and a half miles later, after an easy walk through the desert, though route-finding was a bit difficult in the dark, I found myself standing on the edge of Fresno Canyon. Few Texans have seen Fresno Canyon, and many folks don’t even know if its existence. I felt priveleged to stand there. Across the gorge, the Solitario rose from the floor. From overhead, the uplift appears like an impact zone, but it actually the remains of a laccolith (an uplift of igneous rock in a circular shape) and covers approximately 52 square miles. As light began to spread through an opening between the horizon and clouds, the sky overhead slowly turned to fire, glowing in reds, oranges, and golds. This sunrise was one of the most amazing sights I’ve had the opportunity to both experience and photograph. I hope this image in some small way conveys the beauty of that rare morning. This is a lesson for me… Sometimes I just have to keep moving – hoping it will all be worth it – because sometimes it is. I’m glad I kept walking – even in the rain. Posted in Big Bend Ranch State Park and tagged big bend ranch, canyon, fresno canyon, hiking, sunrise beauty, the solitario, west texas on October 20, 2018 by Rob Greebon. ← Previous: "Brownsville, Port Isabal, and South Padre Island – fun in the sun with humidity"
I thoroughly enjoyed reading this blog post Rob! What a wonderful experience and, I must say, what a wonderfully spectacular sky! I can understand why you say this is one of the most amazing sights you have had the opportunity to experience and photograph. Truly astounding! Anyway, I just wanted to take a moment and thank you for your wonderful blog post. I always enjoy your photography and reading about your experiences.